A Twist in History: Jacob and Sophia's marriage "license"
Jacob and Sophia's marriage "license"
I had previously obtained Jacob and Sophia Haish's death certificates from DeKalb County. This time, I reached out to DuPage County to see if they had a copy of Jacob and Sophia's marriage license. The two were wed in the Naperville area. However, that didn't stop the DuPage County Clerk's office from providing me information. They provided this "placeholder" marriage certificate. 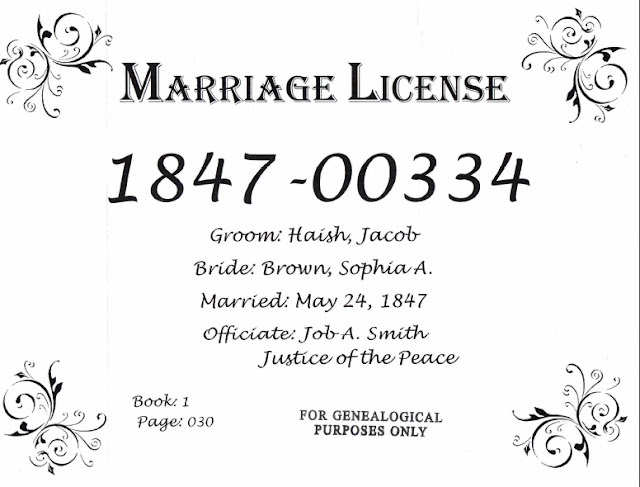 The image below is courtesy of the clerk's office, and provides details of Jacob and Sophia's wedding day, including their wedding date of May 24, 1847, and the name of the officiate of the ceremony.